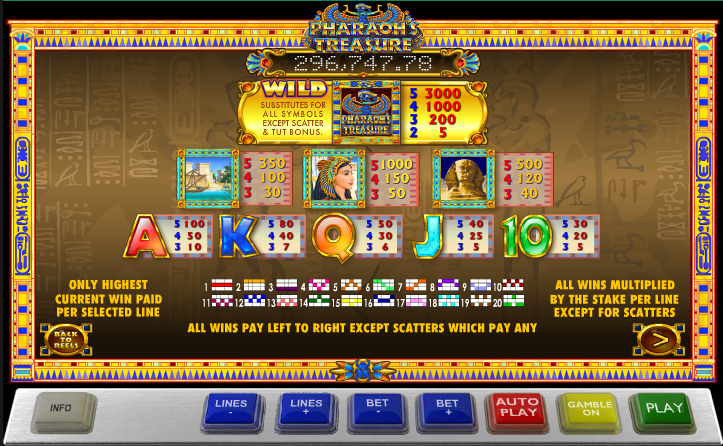 We’ve played a number of Egyptian-themed online slot machines over the years and the genre always seems to offer possibilities for creative bonus games. Ash Gaming join the party with Pharaoh’s Treasure and the addition of a progressive jackpot means it’s well worth a look. The action all takes place inside a tomb lined with pillars and statues; there are five reels and twenty paylines with an ancient Egyptian atmosphere pervading the proceedings. The five lower value symbols are a 10, J, Q, K and A while the higher value ones are the sphinx, a goddess and view of the river Nile. The Pharaoh’s treasure logo is the wild symbol, Tutankhamen is the bonus symbol and the scatter symbol is a blue and gold relic. The Tut’s Tomb bonus game is triggered by landing three, four or five Tutankhamen symbols on an active payline. You will be taken into a darkened tomb and provided with a torch to shine around. Any prizes you reveal in the darkness are multiplied by the line bet and awarded to you. The progressive jackpot can also be won while groping around in the gloom of Tut’s Tomb and finding three Tutankhamen masks here will win you that gigantic prize. Landing three, four or five blue and gold relics anywhere on the reels will award you ten free spins and during this phase, all wins are tripled ; as an extra bonus more free spins can be triggered by landing another three scatter symbols. Clicking the ‘Gamble’ button will turn this feature on and it gives you the opportunity to gamble your most recent win by selecting red or black for a double or nothing bet or one of the four suits for a 4/1 wager. At any point while in the gamble feature you can collect half or all of your money and end the feature. 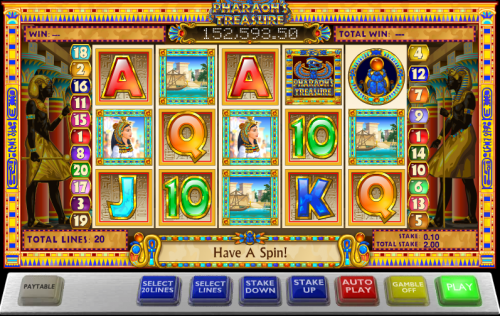 Pharaoh’s Treasure is a nice simple game with the juicy carrot of a massive progressive jackpot win to tempt us. If there’s a criticism it’s that the bonus features seem quite hard to reach but maybe that’s just our bad luck.